Click here to read the Pre-Law Symposium agenda. Attorney Jas of Jas Talks Law, LLC, and Liz Privat, a 1L at Washington University Law School, are excited to share more about the law student experience. Liz is so gracious to share her journey, and Attorney Jas is excited to host her. If you’re a law student dreading the bar exam ..
than you MUST attend this webinar! Must register by clicking here. Meet us at the Mercer Law table. Let’s #TalkLaw! This Friday, we’re kicking off the 2018-2019 #TalkLawTour Sponsored by Mercer Law! We’re #TalkingLaw at the HBCU Pre-Law Expo from 6 - 8 pm! RSVP so you can can hear about my Mercer Law experience, what Mercer Law has to offer you, law school applications, and more! Be sure to watch our “Law School Fair Do’s and Don’ts” youtube video before Friday! Free RSVP by clicking here. DO YOU WANT TO ATTEND LAW SCHOOL WITH SCHOLARSHIP? How: By RSVPing! Click HERE to rsvp. Come #TalkLaw at the National Diversity Pre-Law Conference! The #TalkLawBookTour is coming to Washington, DC! Your Law School Coach, Attorney Jas, will participate in the aspiring lawyers pinning ceremony! Moreover, Attorney Jas will review your personal statements, diversity statements, addendum, resumes, etc. on the spot! And it’s all FREE. All you have to do is register: http://diversityprelawconference.org/. Physical copies of the personal statement workbook will be available! The #TalkLawBookTour is coming to Orlando, Florida! MUST REGISTER! Click here to register. Physical copies of the personal statement workbook will be available! This one is for my future lawyers up north! More details to be provided. REGISTER/RSVP BY CLICKING HERE. #MajorMoves - Determining Which Law School Is Right For You! Download the official MWBLSA Convention Guide by clicking here. Each event is FREE but you must register by clicking here. So excited to return to my beloved HBCU, Hampton University -- the school that turned me from Richmond girl to a Hampton woman! Learn about the Law School Admissions Process, Law School Expectations & the Legal Profession. Learn about the Law School Admissions Process, Succeeding in Law School & Speak One-On-One with Richmond Native & Huguenot HIgh School Alumna, Attorney Jasmin Robinson. Join me at the church that believed in me before I believed in myself: Word of God Fellowship. Partake in our worship service, grab lunch after service, and then return for "Richmond Talks Law." If you can not attend church, meet us at 4 pm. Learn about the Law School Admissions Process: The LSAT, your Personal Statement, Recommendation Letters, and more. Learn about the Legal Profession: Career Options, Researching and Writing, Solving Problems, Work-Life Balance, and more. After a long day of networking and receiving valuable information, Jas Talks Law Presents the Atlanta LSAC Forum Wind Down. Join us for an evening of food and drinks, and a safe environment to debrief with your future Law School classmates and colleagues, immediately following the Atlanta LSAC Forum. 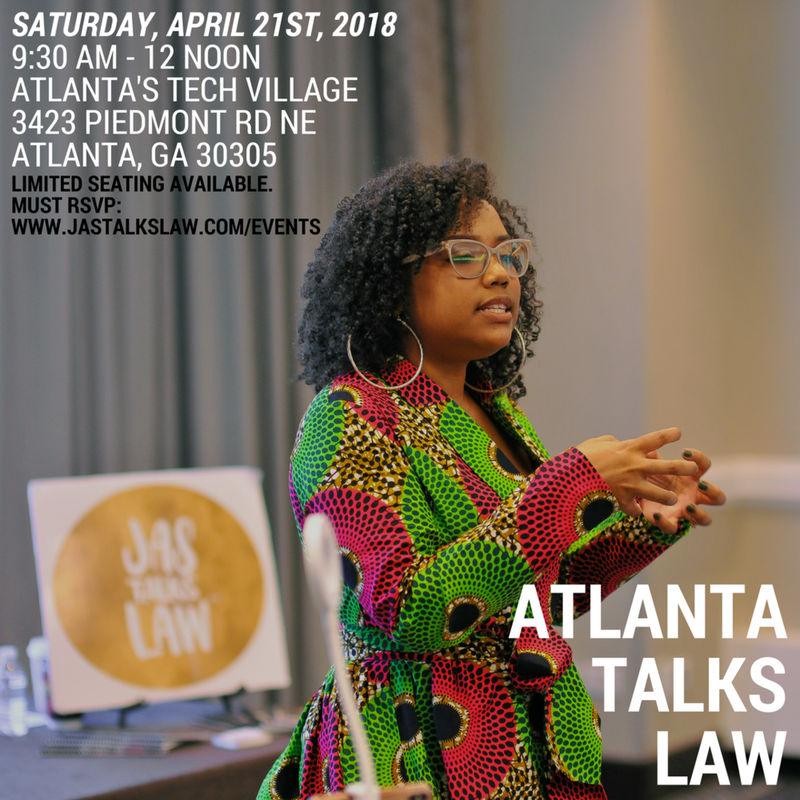 Attorney Jas will be there to answer any questions the group may have and to #TalkLaw one-on-one. We will encourage, educate and edify each other as we continue to make strides in the Law School Admissions Process, Law School, and Legal Profession. ASK FOR JAS TALKS LAW UPON ARRIVING. Please join us at Delores Park for a casual #TalkLaw experience. Bring your blankets, snacks, and beverages, as we encourage, educate and edify each other as we continue to make strides in the Law School Admissions Process, Law School, and the Legal Profession. Attorney Jas will be there to answers your questions regarding the Law School Admissions Process and Law School. Mercer BLSA's First General Body Meeting "Preparing for the School Year"
GABWA Albany Region Presents: Demystifying Law School Part 2 "The Practice LSAT"